I’m biotech investor. So, why I suddenly bought SODA? Especially after recent Cramer’s attack on this company. Well, there are no rules without exceptions to the rules. The whole idea of SODA i.e. the making carbonated water and soft drinks at home is a perfect one. I like this equipment and I have it at my home to make healthy and tasty drinks. Whoever wrote this phrase is stupid and not good educated guy. What educated and smart guys drink (I’m not talking about alcohol beverage)? They never buy bottled water or bottled soda. The quality of both is questionable. And they never drink tap water: again because of quality. So, what they drink and from what kind of water they prepare food and carbonated water and soft drink? Answer is simple: they purify water and use SODA equipment to make healthy and tasty drinks. How to purify a tap water and have 100 % pure water only for $60 per year? I know the only one system that can do it: reverse osmosis systems. 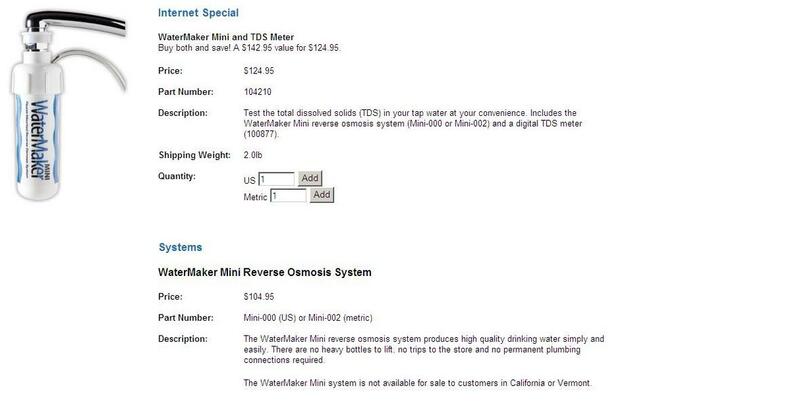 The WaterMaker Mini reverse osmosis system produces high quality drinking water simply and easily. There are no heavy bottles to lift, no trips to the store and no permanent plumbing connections required. This simple system produces several gallons of 100 % pure water per night. And you can control the quality of water with simple setup TDS Meter. But then you only buy one membrane cartridge ($52) and 2 Carbon Post-Filter (GAC) 2-Pack $7 So, it costs you $60 per year to have almost unlimited amount of 100 % pure water during 1 year. You can buy only 60 gallons of bottled water for this money. In plastic bottles that are not healthy because contain some dangerous chemicals. The bottled water lobby say: the water from reverse osmosis systems is almost distillated water and it’s not healthy to drink distillated water each day. Come on, do they really think that we are so stupid? Put this purified water in stillness tank and add some salt to recover it. The cost of home made soda is 25 cents per liter. The cost of home purified water is 10-12 cents per gallon. So, you have cheapest and very clean soda + you can mix it with natural products and good organic cane sugar or natural sweetenes like Stevia and have healthy and safe drinks. "While business in America is booming, and has triple digit growth, said Birnbaum, the U.S. comprises only 20% of SodaStream's business, with 80% of its market in other countries, especially Europe. While the holiday season is expected to be strong for SodaStream in the U.S., in Europe, it is very much a spring and summer story. Therefore, guidance for the next quarter was not as strong as analysts expected. While this may seem like deceleration, then according to this definition, the company has been in deceleration for ten years, and yet it has doubled in the past two years. When asked about challenges posed by the difficult economy, Birnbaum said SodaStream is a value proposition and saves customers money they would otherwise spend on bottled soft drinks. The vast majority of customers are satisfied with the product, and the return rate is only 3%. Sales are still strong in most of Europe, with 25% household penetration in Sweden." "One thing analysts missed was the advantage of SodaStream moving into restaurants with a device that will create sparking tap water. While many customers do not like to drink ordinary tap water, the device will fully filter and purify the tap water before adding carbon dioxide. "This will save money and is a great solution," said Birnbaum. "We will have our brand footprint on millions of tables." It's actually a very good idea to combine the good and convenient water purifying system with soda making equipment and always have both purified water and soda prepared from this water. Disclosure: I have SODA at my portfolio for long.